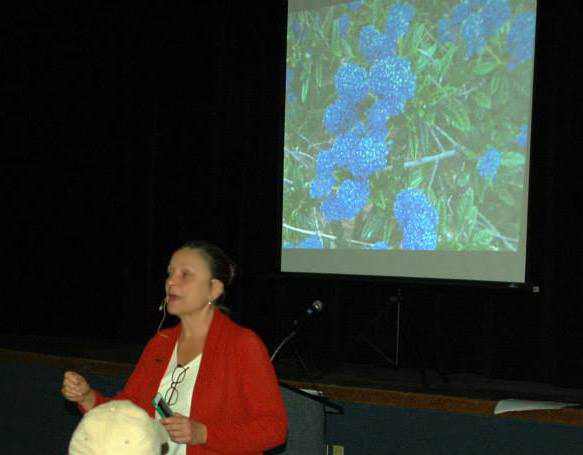 I just got some snapshots of a recent talk I gave to the Southern California Plumeria Society…what was I doing there?? One of their members heard me speak about native plants and the penny dropped for her: maybe there is a way to combine plumerias – mostly native to Central America and Mexico – with California natives in order to create a more sustainable garden. So, the challenge was on: show how the plumeria culture and California native plant culture match/mismatch and what to do about it. We had a crowd of around 200+ and they were lively! My position: use more garden-friendly natives to surround the plumerias, don’t use artificial irrigation in the winter, and, here was the really controversial part for this group: no chemicals…plumerias are “known” to be heavy feeders. Plumeria growers have a challenge in winter: their dormant plants will rot if they get too much water. So, planting them amidst turf or species like agapanthus that require year-round irrigation leads to trouble. Of course, using our natives that thrive on our modest amounts of winter rains makes perfect sense: plumerias don’t get overwatered, and natives get their fill. Then, in the summer, the native species can tolerate a bit of artificial irrigation. Gardeners can run the plumerias on a separate drip system that delivers water to their root zone. Voila! You have a nice potential match. But what about that “heavy feeder” issue? I tell them: foliar organic sprays only on the plumerias. This is a bit iffy and we are waiting to see how it actually plays out. I’ve got some interested gardeners who might be willing to give it a go. But the side light was that so many of the audience were so open to our message and were ready and willing to think about using native plants in their gardens – replacing lawns and on slopes. Notice in the picture above I was showing them a Ceanothus in bloom. Most of them had never heard of this plant. This entry was posted in Garden Design, News, Seasonal Gardening, Talks and tagged floristic province. Bookmark the permalink.